I don’t necessarily believe in fate. After a week’s road trip, top gear style, through some of the remote parts of Vietnam, I might have to! In my first post on Vietnam, at our arrival in Ho Chi Minh city, I explained that my justification for visiting this country was entirely based on a 1-hour BBC entertainment show produced eight years prior to our visit – Top Gear. The show’s presenters, Clarkson, Hammond, and May, made the trip through Vietnam on scooters, much to my delight. Aside from the comedy of three middle-aged men, in loud coloured suits, on scooters trying to traverse the roads of Vietnam I was moved by the scenery of this country and the thought of a road trip in, what was, such a remote location. I even made Lou watch the Top Gear special so she could appreciate the very British combination of banter and road trips. One sunny day (they’re all sunny in southeast Asia), Lou and I were out wandering the town of Nha Trang, looking for lunch when we were approached by a man outside of a shop. The man asked where we were from which, in Vietnam, is my cue to loudly say “England” before they hear Lou’s accent. We got chatting to this Vietnamese man who had the best grip on English we had heard since arriving in the country. “You want to see the real Vietnam?” he asked as if it were his punchline. Fast forward two hours, Lou and I had eaten a nice lunch with Anh and his colleague Sant, only to arrive back at the hotel a little shell shocked and excited at the same time. 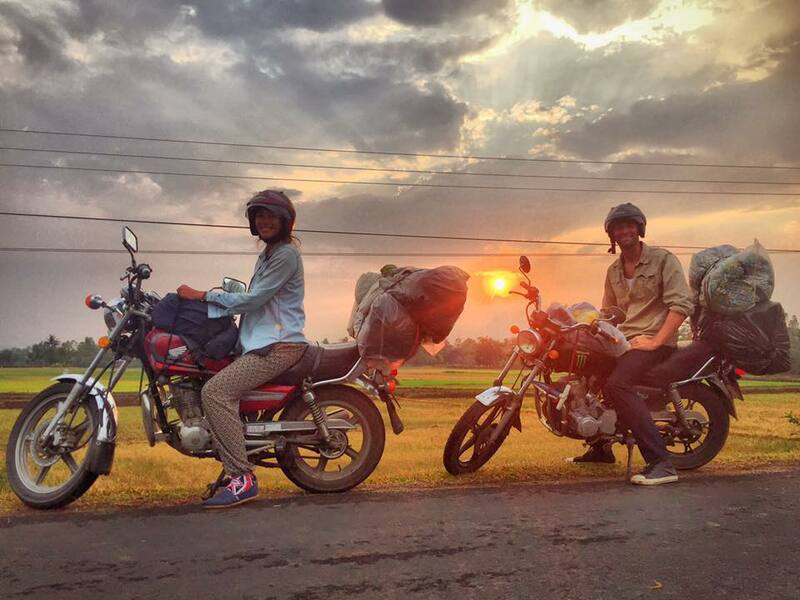 We had agreed to spend a week on motorbikes heading up through the countryside to see the real Vietnam! All rather good I thought, except I can’t ride a motorbike, having only just completed my self-imposed practical lesson on a scooter in the Philippines. The following day I met with Anh for a 40-minute motorbike lesson. It went well. I owned the empty car park cruising around in second and third gear. With my knowledge and feel for Vietnamese roads at an all-time low we decided it would be in our best interests to have Anh and Sant ride the bikes with us, and our luggage, on the back. This was another cause for concern. If most commercial airlines want to charge us for excess baggage how would we fair with all our gear on two motorbikes? Our fears were soon erased when our guides expertly strapped all our luggage to the back of the bikes using rubber ropes. The luggage almost formed a comfortable seat back whilst riding. After a week of nerves, excitement and anticipation we were on our way! Our itinerary was a 5-day trip from Nha Trang up to Hoi An that headed inland and through the mountains and jungle regions of the countryside (covering about 900kms). We’d learn about the farming methods in the country, the lifestyles of the people, the food, and the culture. All whilst sat with our legs around two strangers whom we’d met a week earlier. Adjusting to life on the back of a bike is tough on the body. With an average of 6 hours per day on the bikes we weren’t left with a lot of choices and, upon disembarking the bikes, we would often maintain a “Y” body shape until our muscles clicked back into operation. During my first stint on the bike, I decided, in true Top Gear style, to provide an in-depth appraisal of the bikes, their handling, and performance. Both of our bikes had two wheels. Sometimes one bike wouldn’t start. Neither bike had a working speedometer. Sometimes we would stop for fuel. Fortunately for our uninitiated bodies, we made frequent stops. Anh, our lead driver, had taken an overnight bus back down from Hoi An to meet us for this trip. Having had about 3 hours sleep he made a beeline for a hammock at our first rest stop giving Lou and I a chance to try Vietnamese coffee and our own hammocks. The Vietnamese equivalent of a motorway service station is a small cafe, often what we would consider the living room of someone’s house, with a few plastic tables and chairs and some hammocks. Many Vietnamese people, who make long journeys on scooters and bikes, will rest up at these stops. Vietnam, according to our guides, is the second-biggest coffee exporter in the world, behind Brazil. The locals enjoy a sweet coffee, sometimes blended with cacao (about 10%), that is served as a drip coffee over condensed milk. I came to enjoy this style of coffee as much as my beloved flat-white during the trip. Following our break, the drive took us up into our first area of mountains. It felt great to be away from a built-up area and get into the country. The road curved and twisted as we climbed, it was great to be on the bikes winding round the side of the mountain. One of the stranger experiences was the complete abundance of butterflies, something that became a constant during our time in the countryside. Butterflies were everywhere. We continued to make frequent stops throughout the day, mostly for viewpoints and to learn about the farming and crops in Vietnam. Tapioca is widely farmed here, it is derived from the cassava root and used as a thickening agent and as the pearls in Lou’s beloved bubble teas! In the afternoon, we experienced our first rain (and some thunder) in Vietnam, a downpour that lasted about 30 minutes. We took cover and waited for the rain to subside. Anh let us know that the locals would be very thankful for the rain on their crops, in some villages they would sacrifice a bull to the Gods to show their thanks. We ventured on to our first rest stop, a large wooden cabin on stilts, with mattresses on the floor and nets to keep out the mosquitos. At nice dinner with Anh and Sant we chatted about the day over some rice wine – strong and nasty stuff but effective enough to put us quickly to sleep after a long first day. Keep an eye out for Part 2 of the trip as we venture further off the beaten track!